Struct can be used to define custom data types in Go. Often times, we can not handle the real world information using the standard data types which come with languages. While it is not impossible, it is highly inefficient. For example, in an eCommerce application, we have the ShoppingCart in which we put products for checkout. There are a lot of attributes of Product, its name, the ID used internally, the cost, number of the products in stock, etc. name is a string used to store a product&apos;s name. itemID is an int used to store for reference. cost is a float32 of the item. isAvailable is a bool which is true if the item is in stock, false otherwise. inventoryLeft is an int of the number of products left in stock. goBook.name = "Webapps in Go"
There are three more ways to define a struct. // initialize four values by format "field:value"
In the earlier chapter, we saw how to define a struct with field names and type. 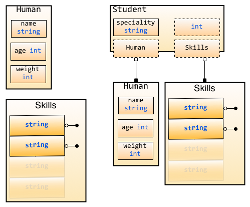 Embedded fields can be thought of as subclass and superclass in Object oriented programming. // includes all fields that Human has. We see that we can access the age and name fields in Student just like we can in Human. This is how embedded fields work. We can even use Student to access Human in this embedded field!